A modern day equivalent to someone Oscar Wilde would not have minded to have in tow. 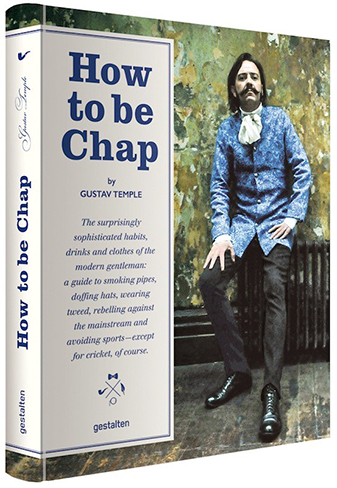 “How To Be Chap - The Surprisingly Sophisticated Habits, Drink and Clothes of the Modern Gentleman” is both a documentation and a guide book to explore the roots, the most prominent exponents and underpinning ideas that inform what constitutes a “chap” in this day and age. Beautifully illustrated, it is a source of inspiration in a world of prefabrication that makes choices for you conveniently with the click of a button. Even though there is an attitude that is an integral part of the chap-package, we are not necessarily talking elitism here – we are talking lifestyle and digging a bit beneath the surface of face value appearances. Revisiting the traditions and values of the past to enhance the now and confidently stride into the future and enhance your persona – be it with accessories like an umbrella, tweed outfits and a pipe or a general demeanour based on cultivated tastes. While there is effort made in terms of research and shedding light on the fine things in life, one of the merits of the book is that it does not take its approach religiously serious and therefore makes for an enjoyable read no matter what your personal style may be. Once you open yourself to the chappish ways, it is not hard to see that there is something to it – something that might add a bit of pizzazz to your blokey way of carrying yourself, especially if your style is informed by the notion that it is unmanly to look after yourself and out thought into how your carry yourself.